Why a "Board Certified Orthodontist"? To start with, an orthodontist is a dentist who has completed a (post-doctoral) graduate program accredited by the American Dental Association in the specialty of orthodontics. A dentist who graduates from a specialty program becomes an orthodontic specialist, who is after a few years of experience eligible to become board certified through a voluntary examination process of The American Board of Orthodontics (ABO). 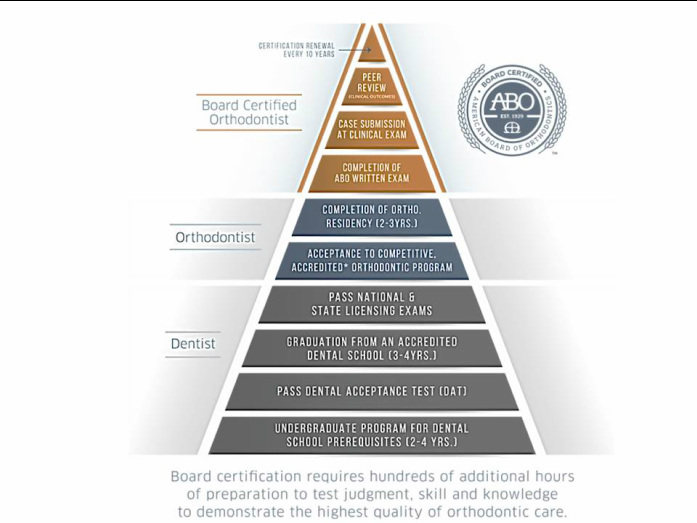 According to the ABO, "involvement in the certification process is a demonstration of the orthodontist's pursuit of continued proficiency and excellence.The certification process involves a thorough Written Examination covering all areas of information on which an orthodontist should be knowledgeable. Successful passage allows the orthodontist to present treated cases which will be evaluated by expert examiners of the Board during a Clinical Examination". the ABO website under "Find an ABO Diplomate". Always verify the certifying board when an orthodontist does not provide this information. The ABO is the only certifying board recognized by the American Association of Orthodontists and the American Dental Association.